I think that I might like mini cheesecakes even more than full size cheesecakes. Sure, a tall slice of creamy cheesecake is hard to resist, but mini cheesecakes are quick and easy to make – and that means that I can have cheesecake a lot more often. Mini cheesecakes are also easy to put a variety of flavor variations on and these Toasted Coconut Mini Cheesecakes are a new favorite. The cheesecakes start with an easy batter that is packed with toasted coconut and flavored with a bit of vanilla extract. I lightly toast the coconut in the oven before incorporating it into the batter. As delicious as the nutty, buttery flavor of toasted coconut is, you don’t want the coconut to be overly toasted in this recipe or it will take away from the creamy texture of the cheesecake. The ideal toast is to get the coconut to a light golden brown before mixing it in. I topped the cheesecakes with a sprinkle of untoasted coconut, which gets a bit of color while the cheesecakes are in the oven. 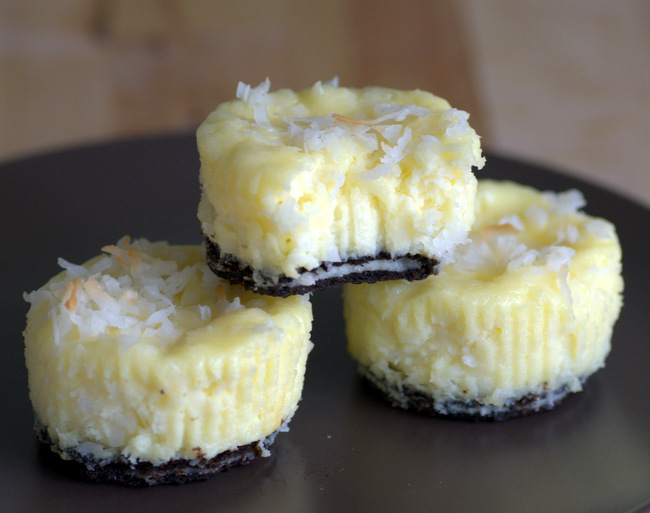 Although I’ve been known to eat a mini cheesecake while it is still warm from the oven, I recommend chilling these in the refrigerator for at least 2-3 hours to firm them up before serving. They can be served as-is, with their wrappers on, or the wrappers can be peeled off before plating them. The recipe can also be halved if you feel like you need a smaller batch than this recipe yields. The cheesecakes do keep well in the fridge for 2-3 days after baking, however, so having a few leftovers isn’t a bad thing. Preheat oven to 350 F. Line 16 muffin cups with paper liners. Place 1 Oreo in the bottom of each muffin cup. Top with approximately 1/4 cup cheesecake batter. Sprinkle approx 1 tsp remaining (untoasted) coconut over each of the mini cheesecakes. Bake for 16-19 minutes, or until cheesecakes are set. Allow cheesecakes to cool in the pan (they may fall slightly as they cool) to room temperature. Refrigerate for at least 2 hours before serving.